Damascus steel is beautiful and mysterious, an ancient formula used to craft some of the best swords history has offered. The technique was so admired that some believed it was magical in nature. It cast a gorgeous blended pattern on the blade, and to top it off was stronger than other metals used at the time. Then, around 1700 CE, it disappeared. Today, Damascus steel isn’t just for blades. 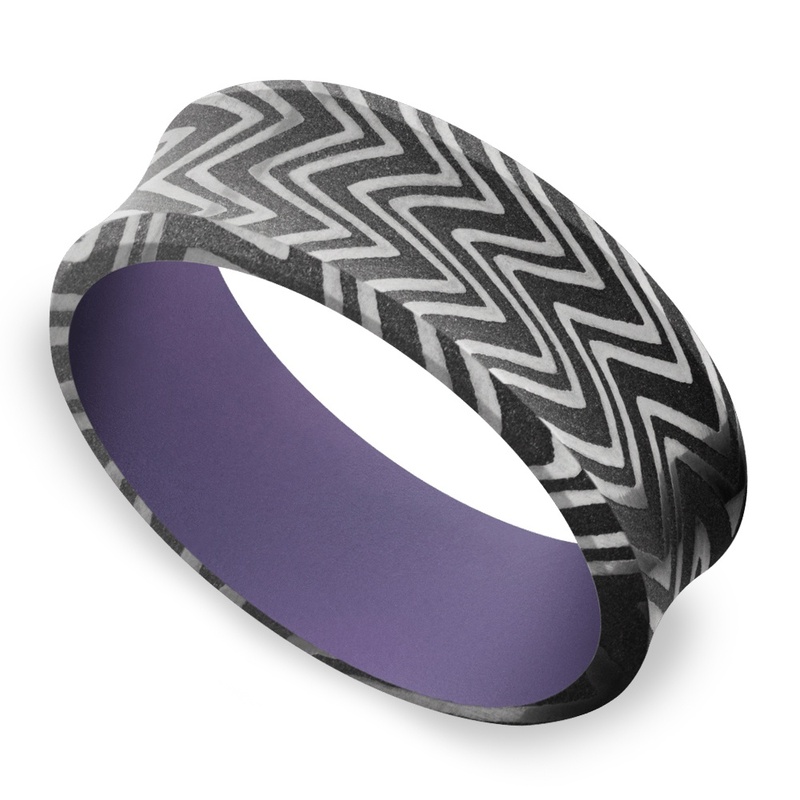 It has also been the starring component of a variety of men’s wedding bands. What makes Damascus steel so unique and visually stunning? How do we have new examples of Damascus steel when the technique was lost 300 years ago? Why does its popularity endure? Read on about how this ancient sword crafting technique became one of today’s hottest wedding ring trends for men! While the techniques involved in forging the swords allegedly originated in Damascus, Syria around 500 CE, the metals used to make it were imported from Persia and India. 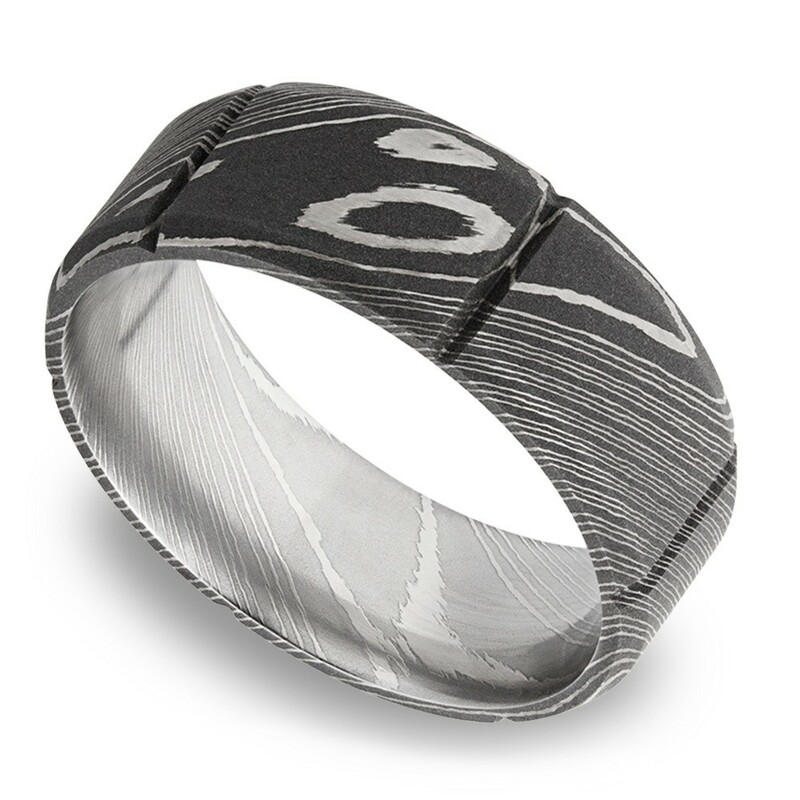 Craftsmen would blend from 2 to 5 alloys together to form the metal, creating the distinctive patterns we know today. Around the 19th century, they suddenly stopped being made when the composition of the imported metal changed. True Damascus steel will likely never be made again, but studies of the ancient blades have given us a lot of clues on how to make it. Now, there are three techniques used to recreate this beautiful look – etching, billets, and reverse-engineering. Etching is pretty, but it is not Damascus steel, and the engraving can wear off over time. 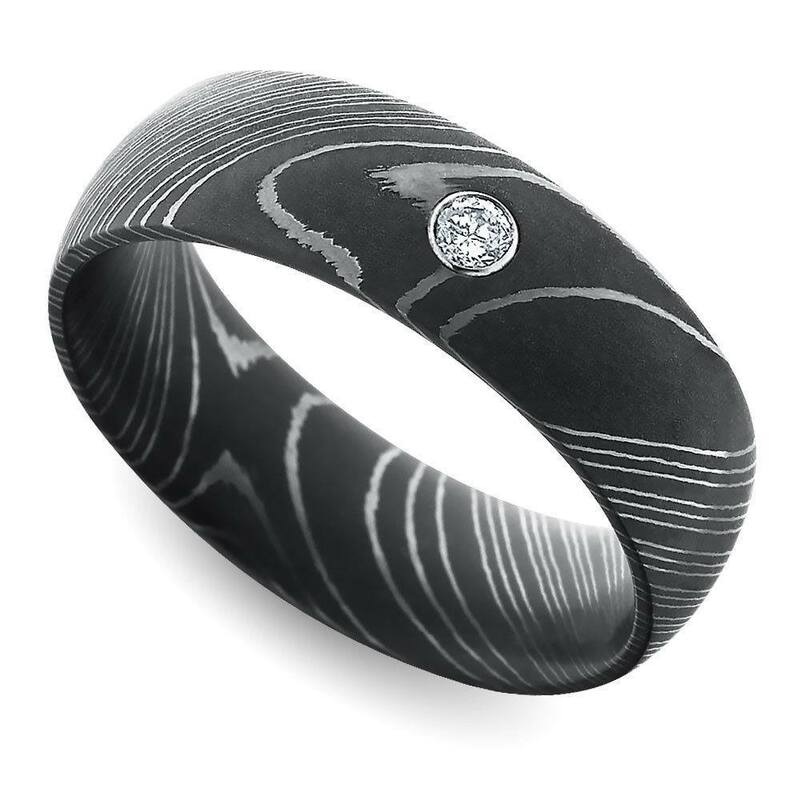 Billets are a modern technique that works the metal together in bands to create the distinctive look. Reverse-engineering examines archaeological specimens to re-create the amount of each alloy. 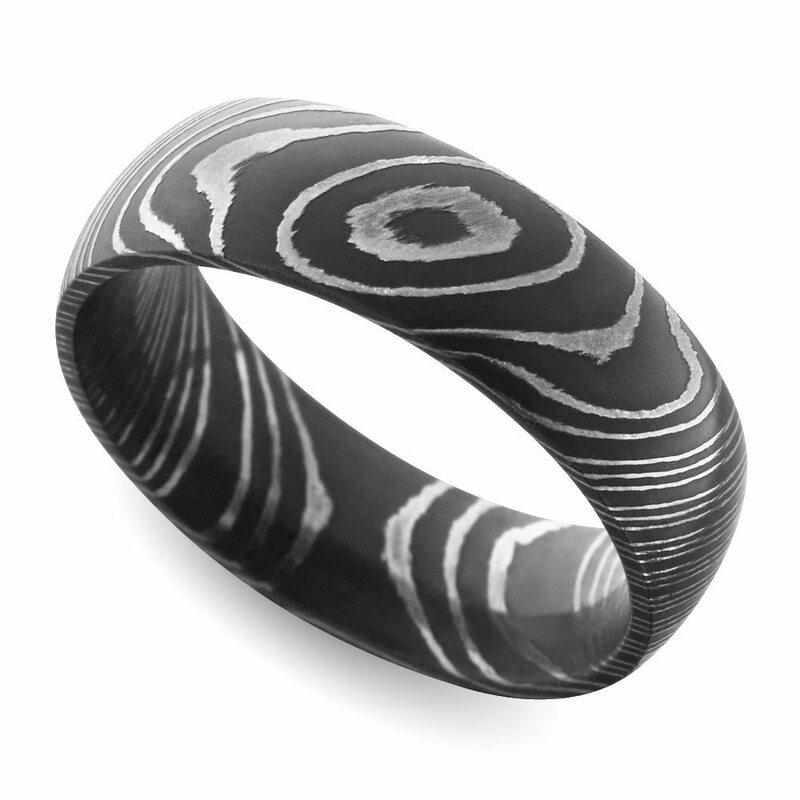 The most noticeable thing about Damascus steel is the patterns in the metal. These are made by the blending of alloys, most notably iron, coal, and wootz. These patterns cannot be replicated using modern techniques because the secret is in the wootz, according to metallurgy scholars. Even billets don’t produce the same kind of pattern as having the right percentages of each alloy. Billets do manage to capture the strength and flexibility of Damascus steel in more crisp patterns, as opposed to the swirly, wavy ones of the medieval era. What’s so great about Damascus steel that it was so revered, anyway? While these blades were beautiful, they were also deadly. They could be folded into sharpness so fine that legends arose about them. They were so durable that even today, archaeological specimens can be viewed in museums. They were also flexible, a quality arising from their unique structure. These attributes can not only form a wedding band that lasts, but also symbolize the strength of the marital union. Damascus steel is a great option to save on your wedding budget, since all that durability comes at an affordable price. 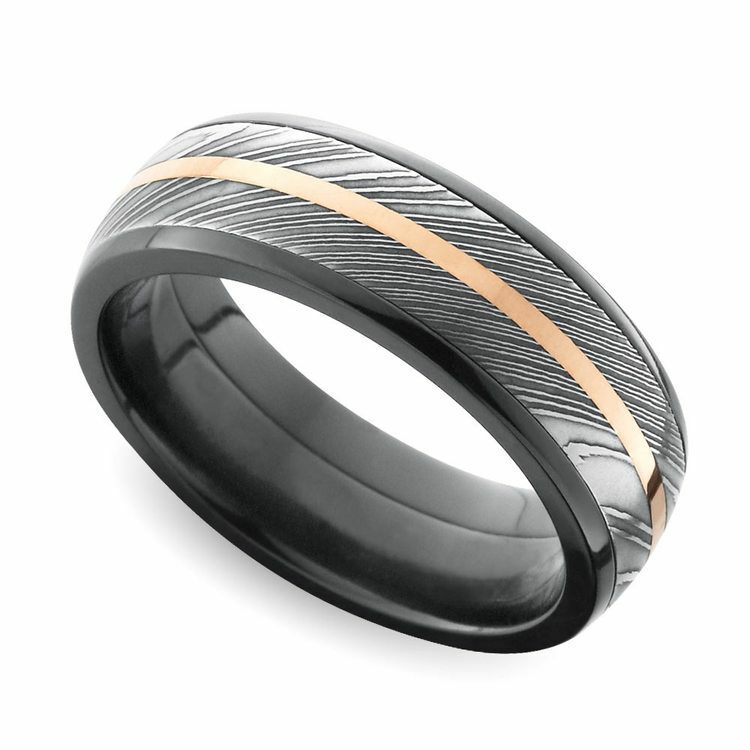 Since most Damascus steel is handcrafted, couples have a lot of options available for the perfect men’s wedding ring. 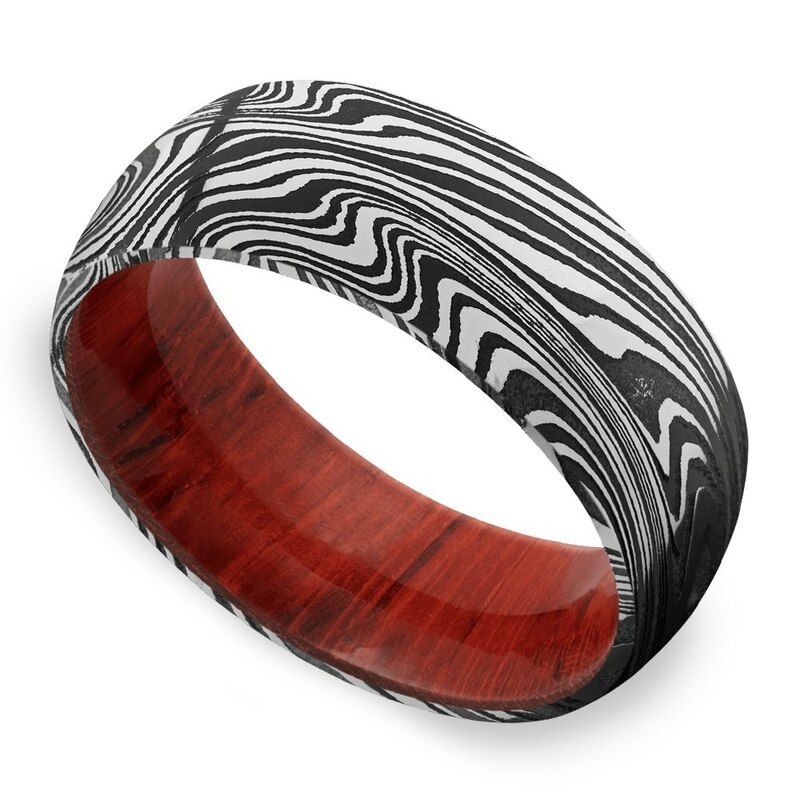 Damascus steel rings can be embellished with wood or another metal, domed, flat, or comfort fit. The patterns and even the shape can vary with the wishes of the groom, so your only limits are your budget and your imagination! 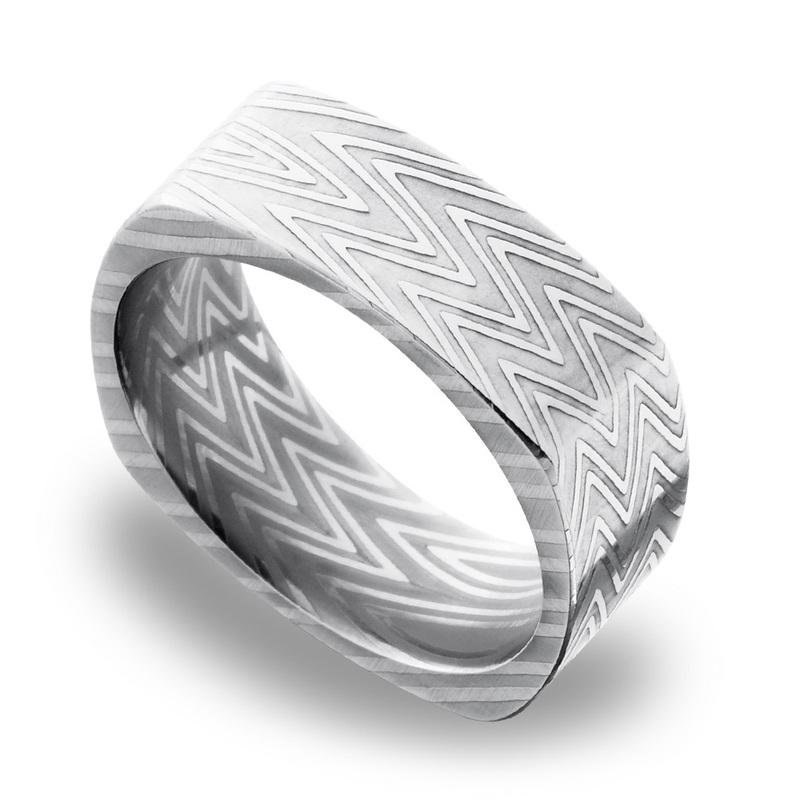 Beautiful, elegant, and with rich history behind it, Damascus steel can be the perfect wedding ring for the discerning groom on a budget. They look great, last a long time, and can be made to anyone’s tastes. There is such a wide array of options available that you are certain to find the perfect wedding band for your wedding!